Master bedroom closet after installation. 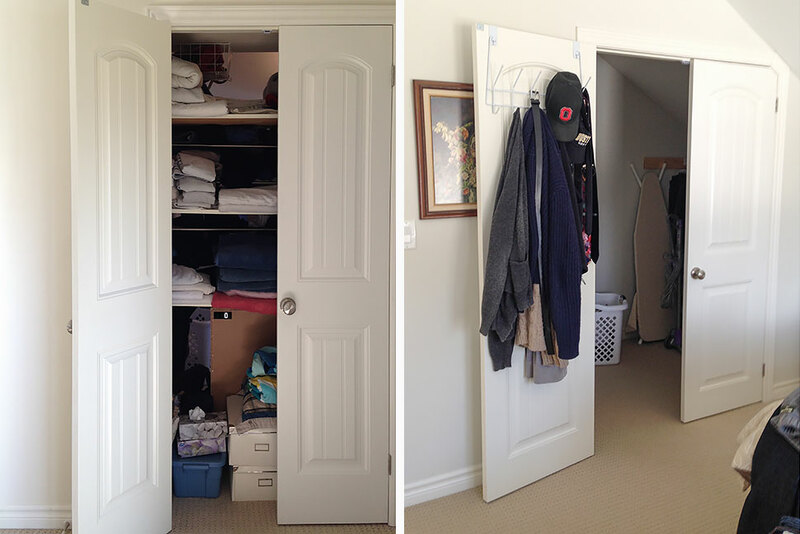 After a full house renovation that doubled their home’s size, Jay and Lissa had their contractors install some closet doors. A few simple shelves were added to temporarily accommodate what would one day be their new master bedroom/linen closet. It was supposed to be a temporary fix to an awkward space. The closet stands in the middle of the top story of the house. It reaches to the roofline, twelve feet high and decreases by one-foot increments to four feet high – in other words it’s a big triangle. The hallway access to the full height, linen closet sported widely spaced, deep, wood shelves that reached through to the master closet. With no wall between them, blankets and other linen often got pushed into the master side and clothing piled up next to sheets. They installed a makeshift hanging rod for Jay’s shirts and relegated Lissa’s dresses and skirts to a closet in another room. They repurposed a couple of shoe racks into additional shelving and stored luggage on the highest shelf to make the space more workable. But Lissa’s frustration grew. The unfinished wood shelves caused numerous pulls on sweaters and towels and it wasn’t fun running around the house just to get dressed everyday. It was time to organize the closet properly. Online tutorials for measuring and purchasing DIY racks, drawers and shelving was briefly considered but the awkward dimensions of the space proved too challenging a layout for mere mortals. It was time to call the experts. Jay and Lissa chose Organized Interiors because they’re a local company with a great selection of products and creative storage solutions. They manufacture most of their products right on the premises and their website makes it easy to book a free in-home design consultation. Lissa filled out the website consultation form and within a day she received a confirmation email. After that, an appointment was set up with their design consultant, Lisa Barnes. All Organized Interiors’ design consultants are specialists in storage solutions. They are experts at turning even the most awkward spaces into organized, manageable and maintainable interiors. It’s not often you’re told, “don’t tidy up” before company comes, but Lisa wanted to see how the Kerrs really lived. Designers don’t judge. They have busy households themselves, can relate to household storage needs, and they genuinely want to help you with a solution. Lisa came to their home, prepared to measure the space, draw up a plan and show them some possible layouts. She brought a selection of samples to help navigate them through the “big picture” process of creating personal storage solutions. The Kerrs wanted the two spaces separated. 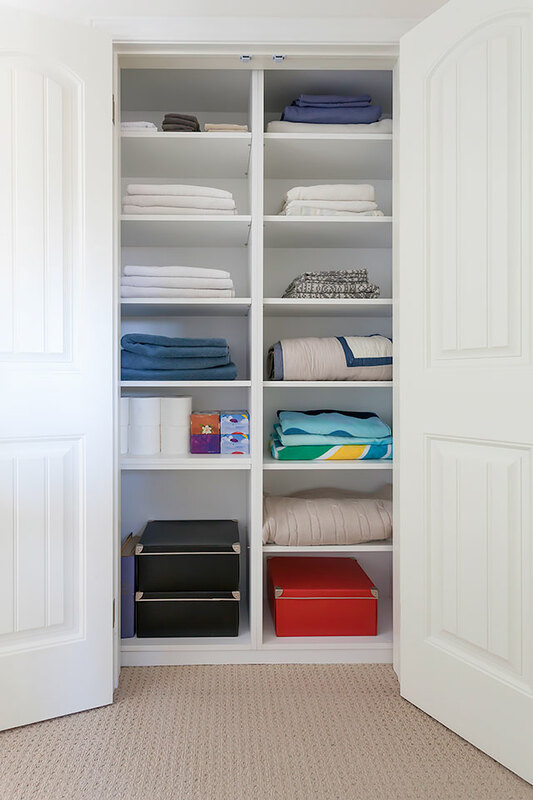 They wanted the linen closet to be enclosed an only accessible from the hallway. 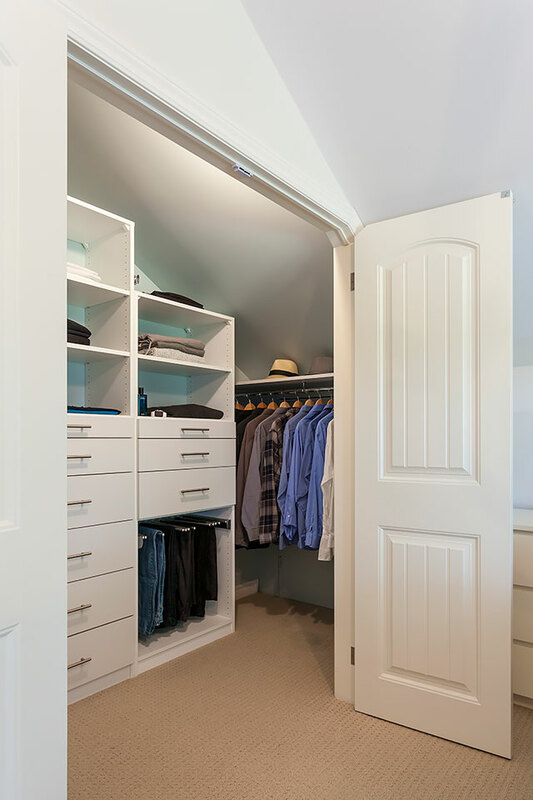 The master closet had to have room for all their clothing storage and room to change in. Lisa got to work right away measuring every angle of the closet space. She sketched out the space so the couple could get a visual reference of how and where the configurations of storage options could work. Organized Interiors has a full range of finishes for drawer fronts and cabinets – everything from solid wood to low-maintenance laminate finishes in a full range of styles, textures and colours. All of their cabinets are made from ¾ inch, furniture-grade plywood to ensure you’re getting the strongest, most resilient system available. All accessories are high quality and hard working, designed to last. From the samples, they chose the attractive, low maintenance, Latitude North. It’s a white laminate finish with a subtle grey strie pattern you can see and feel. They ordered drawers with the soft-close feature, an upgrade they knew would be a benefit for the amount of use [and abuse] the drawers would get. Before she left, Lisa was able to give Jay and Lissa an approximate quote for the project. Within a week, Lissa received a detailed 3D rendering along with plans, measurements and a final quote. Before the order was placed they met at the Organized Interiors showroom to review their order, make changes and pay for the first half of the invoice. 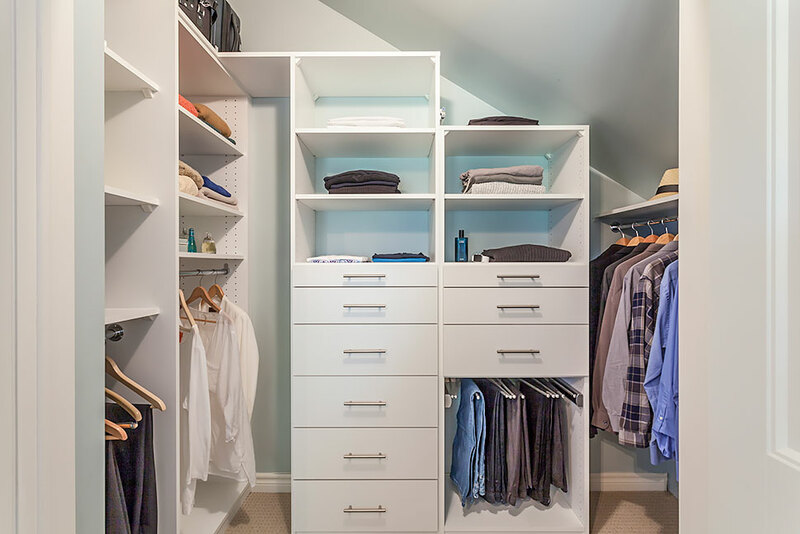 Visiting the showroom was an important part of purchasing the closet because it allowed Jay and Lissa to see options they may not have considered. In the 10,000 square foot showroom, clients can walk around beautiful, full-sized displays featuring various product lines featuring a wide range of cabinetry finishes. 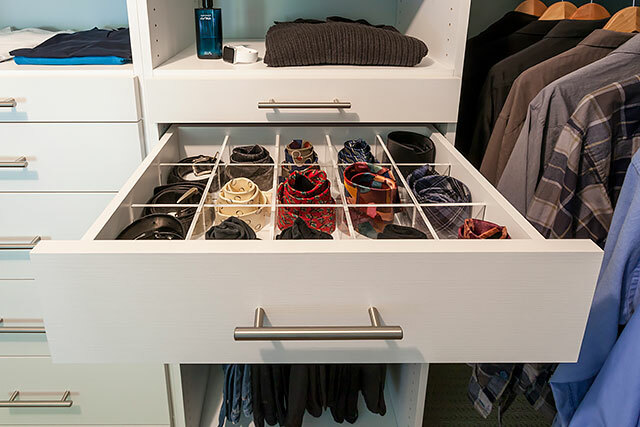 Closet accessories like valet rods, jewellery drawers, tie racks are also on display. 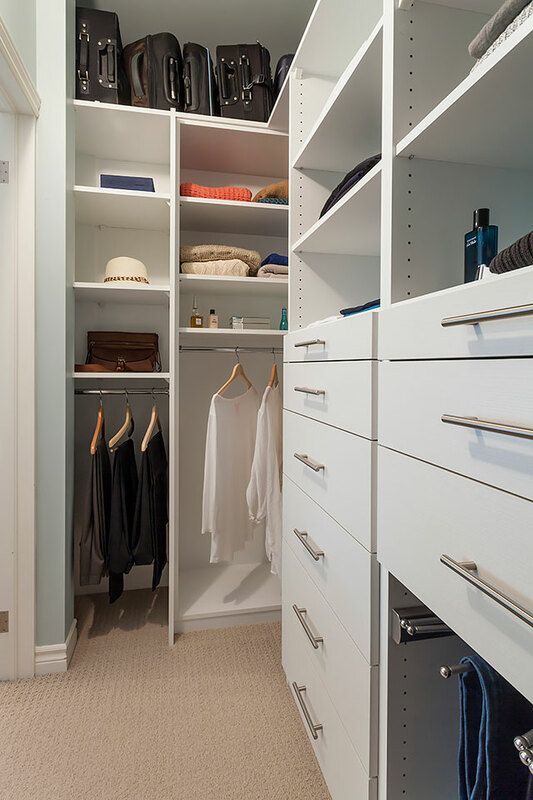 The finishing touch for every closet is the decorative hardware – pulls, knobs and hooks. And Organized Interiors has the largest display in the greater Toronto area. 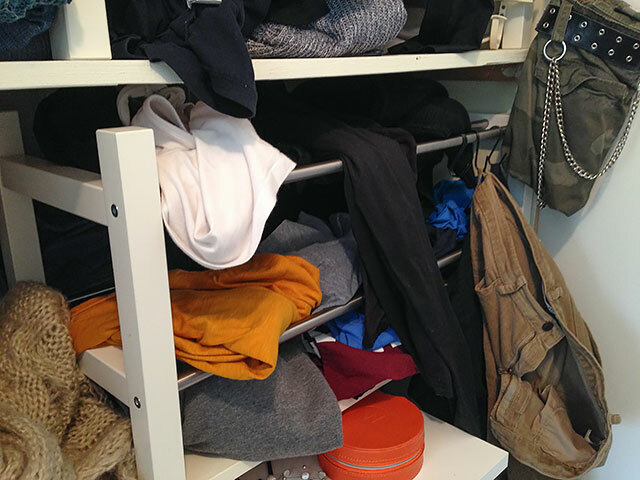 Jay and Lissa decided to add a valet rod that retracts when not in use and drawer dividers for Jay’s socks and ties. They also added two velvet-lined jewellery drawers. Once the order is placed, it is manufactured on-site at Organized Interiors and ready for installation in approximately four weeks. Some products require special manufacturing and may take a little longer. An installation date was sent by email and confirmed with a phone call. 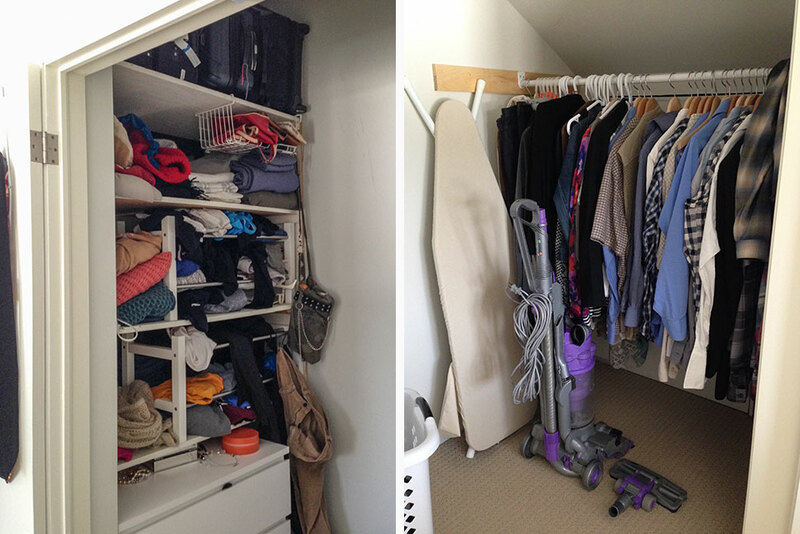 Before the installation, the closet space had to be completely emptied and cleaned. Since this demo didn’t require special skills, Jay dismantled and removed the old shelving. With the space empty, Lissa took this opportunity to paint the walls a calming blue colour. Once installation day arrived, the only requirement was to open the door for the installers and ensure that an electric outlet was available for any custom cutting. The installers brought protective floor covering and changed their footwear between indoor and outdoor work. The linen closet was installed first. As the day progressed, the components of the master bedroom closet started to take shape. The first rod was hung and the shelf above it. Once all the components were in place, even the fine carpentry detail and caulking was beautifully finished. Before they left, the installers tidied up and vacuumed the surfaces for any fine wood particles left over from additional cutting. By the end of the day the Kerrs were able to move their clothing and accessories into their new closet. The last thing was a follow-up phone call from Lisa asking if everything went well and if they had any problems or questions. Jay and Lissa recommend not waiting eight years to purchase a custom closet. From the beginning of the process to the end it was an easy, problem-free experience. Every single day I enter that closet and feel a strong sense of contentment. It just looks and feels right. I would recommend Organized Interiors to anyone.